The recently introduced VLZ4 Series of mixers from Mackie is the company's next generation in a long line of analog mixers. Mackie refers to them as “the original no-nonsense compact mixer series” and I must agree, as I have often used them over the years as the ultimate "utility mixer" at gigs. The VLZ4 Series is comprised of eight models that all incorporate the company’s premium Onyx preamps. The 402VLZ4 is the smallest in the series at 4 channels, while the 3204VLZ4 is the largest, offering up to 32 channels. Both the 3204VLZ4 and 2404VLZ4 include two FX processors, 4 channels with compressors, and 4 compressors on the sub-groups. The 1604VLZ4 that Mackie provided for this evaluation is the largest rack-mountable unit in the lineup, providing up to 16 channels, 4 sub-masters, left, right and mono outputs, and a host of routing options. 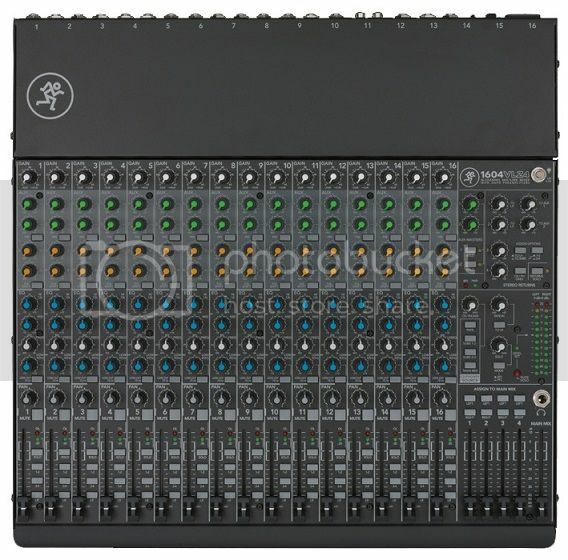 The mixer can be configured in quite a few different ways, including as a tabletop mixer (as it comes from the factory) with the jacks to the rear. As noted, it can also be rack-mounted in a slant-top rack with the jacks again to the rear. By removing a few screws, the rear input pod can be rotated, and the unit can be mounted in a standard vertical rack with the jacks to the rear. An optional accessory called the RotoPod will allows users to install the pod facing the front, affording easy access to the jacks for patching whether the unit is in a rack or on a surface. In addition, the rack-mount ears can be attached at two different locations. One positions the mixer’s surface flush with the rack rails, as with most rack-mount gear, while the other position lowers the mixer’s surface and knobs below the rack rails, affording the knobs some protection. All controls on the 1604VLZ4 except for the power switch, phantom power and mono output volume are located on the front surface. Each channel includes a gain knob, Aux 1 and Aux 2 knobs with a pre/post switch that changes both auxes, Aux 3 and Aux 4 knobs with a 3-4 or 5-6 switch that changes both auxes (more on this later), 75 Hz low-cut switch, 3-band mid-sweep EQ, pan knob, mute and solo switches, submaster and L-R assign switches, and of course, a fader. Each channel also sports a -20 dB/solo LED and overload/mute LED. The solo LED acts as a signal LED unless the solo button is pressed, then the LED glows constantly. The same concept is applied to the overload/mute button. The master section includes the aux masters, stereo returns, control room/headphones knob with source switches, tape in knob, solo knob with AFL/PFL mode switch, 12-segment LED meter, level and solo LEDs, headphone jack, 4 subgroup faders each with L-R assign switches, and of course, the master fader. The rotatable rear patch bay offers 16 XLR inputs, 16 TRS line inputs, 16 TRS insert jacks, 8 TRS direct outputs for the first 8 channels, 6 TRS aux sends, 4 stereo TRS returns (8 jacks), 4 TRS subgroup outputs, L-R TRS control room outputs, L-R main TRS inserts, and L-R and mono TRS outputs. It also features a pair of RCA tape in/out jacks, an IEC power cord socket, as well as the main power switch, phantom power switch, and mono output volume noted earlier. Out of the box, the mixer is set up for tabletop usage with the jacks to the rear. The first thing I noticed was the nice contrast between the knobs and the dark black surface. The knobs are colored according to function and it’s easy to see them in low light. There is enough room in between the knobs to make adjustments easily without inadvertently moving an adjacent knob, even for my fat fingers. The mixer also looks and feels extremely rugged. On the bench, the 1604VLZ4 was a breeze to hook up as everything is clearly labeled. The Onyx preamps sound very nice and the noise floor is very low. The EQ, while only 3 bands, is quite versatile. The low band provides up to 15 dB boost or cut to frequencies below 80 Hz. The mid band has a fixed bandwidth of 1 octave and provides up to 15 dB of boost or cut from 100 Hz to 8 KHz. The high band provides up to 15 dB boost or cut above 12 kHz. While the 1604VLZ4 offers no onboard effects like the larger mixers in the series, there are a multitude of patch points to interface anything you'd need for most gigs. Satisfied that the mixer was working correctly and not damaged in shipping, I put it to work while testing some new loudspeakers that we'd just received. Interfacing the console was easy and the subgroup outputs enabled me to make quick comparisons between different speakers to ensure that they were operating correctly. Here's where I discovered one minor nit to pick: there are no XLR outputs, just 1/4-inch TRS outs. While I have a bunch of adapters, it would have been easier to just plug an XLR cable between the mixer and the powered loudspeakers. However, looking at the rear pod, it’s clear that there's really no available real estate to place XLR outputs, so I can understand the decision to go with all TRS outs. And it turns out that in real world use, it’s not an issue, especially since many EQs offer both TRS and XLR ins/outs. I could use TRS cables to go from the mixer to an EQ, and XLR cables from the EQ to the amplifiers or powered loudspeakers. Most gigs where I deployed 1604VLZ4 were corporate speech affairs with podium microphones and various audio playback that make up a lot of my company’s work. While the mixer doesn't have stereo channels (I don’t count the tape in as a channel), it was easy to patch the various playback units into the line inputs and operate the pair of faders for each input. I'd rather have full-featured mic channels available than a few stereo channels with a reduced feature set any day -- I can always turn a stereo playback into a mono signal with a “Y” cord or use adjacent mono channels for stereo inputs, but I can’t plug a mic into a line-only stereo channel. In case of encountering any problematic rooms, I brought along a parametric EQ and insert cable for the podium mics, but the channel EQ and low-cut switch made for easy work in getting a good sound from the mics to the PA without needing to patch in outboard channel EQ. The sub group outputs came in very handy for recording and sending feeds to video world. Routing signals was a breeze. One gig had a simple DJ setup, and we used the 1604VLZ4 connected to laptops and an iPad. Again, using adjacent pairs of mono input channels, I connected everything and it was simple to operate both faders at the same time. Speaking of faders, this mixer series sports a new fader cap design that I didn’t like at first, but it quickly grew on me. The fader caps are not rounded on the ends, but instead arch outward. There's also a nice cut-out on the sides, making it easy to read the legend lines below and reset the fader to a previous position. The headphone circuit provided ample amounts of volume with a set of closed headphones to overcome the room PA and solo up tracks. For routing options and flexibility, it’s hard to beat the 1604VLZ4. This mixer's mic preamps sound great, it provides a lot of inputs and outputs, and it's built like a tank. 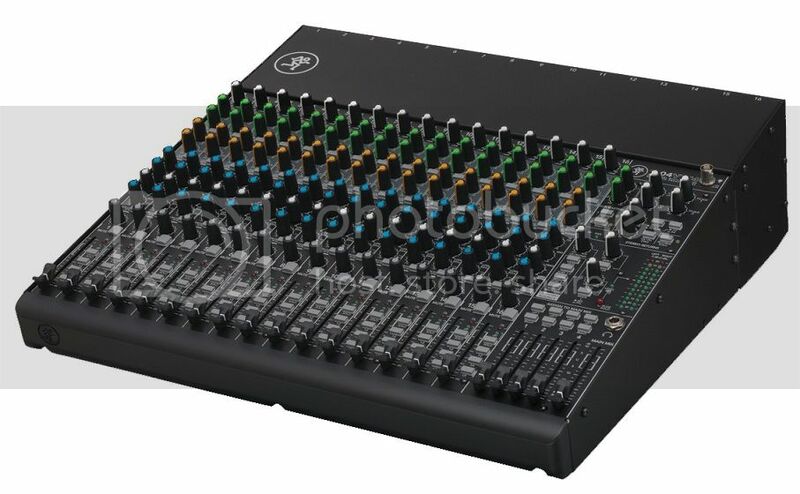 It's perfectly suited for live production, installs, and of course, as a larger utility mixer on big shows. U.S. MSRP: $1,149.99. Prices for the series range from $129.99 for the 402VLZ4 to $1,699.99 for the 3204VLZ4. Craig - the way I'm reading the bold section is that you can use a "Y" cord to reduce a stereo source to a single mono channel - I'm sure that's not what you meant. Using a "Y" cord to mix down a stereo source to mono is the wrong way to do it - result is lousy sound, and "stress" on the output circuits of the stereo source. There are devices like the Switchcraft 318 Mini Audiostix or a Radial Pro AV.